Interestingly, pink is the only tint of a primary color with a name of its own. By contrast, 'baby blue' is still blue, and light green is still green! Of course, some pale greens get their own monikers (e.g. 'mint') but these are not as universally used as 'pink'. Also, check out how utterly different the psychological effects of the color pink are from those of its source color, red. "... a June 1918 article from the trade publication Earnshaw's Infants' Department said, 'The generally accepted rule is pink for the boys, and blue for the girls. The reason is that pink, being a more decided and stronger color, is more suitable for the boy, while blue, which is more delicate and dainty, is prettier for the girl.'" Here in Europe, refined/sophisticated (as well as embarrassingly kitschy and garish) versions of the color pink have been used both in 'masculine' and 'feminine' interiors - on and off - for centuries. 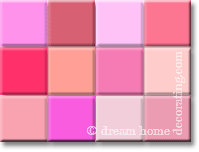 The European country with the least hangups about using pink in interior design is probably France. However, you don't need to be French in order to like some of the 'male compatible' pink color schemes I've put together for you. Generally, when used in interior design, the psychological effect of the color pink is described as soothing and comforting. In Rudolf Steiner schools and hospitals, interior walls are often colorwashed in warm, gentle hues of the color pink because of their soothing, healing qualities. Also, what about all the pink-colored cakes & candy you have eaten, or been tempted to eat, in your life? 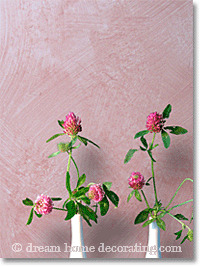 Some versions of the color pink have a sweetness and freshness about them that is very hard to resist. I mean, c'mon. Pink cupcakes are awesome. Just like red, pink color comes in lots of hues. Ripe-peach pink, bubble gum pink, hot Caribbean pink - they each have their own appeal and psychological effects. In the 1970s, head coach Hayden Fry of Iowa State University decided to utilize the psychological effects of the color pink to the advantage of his football team. He had the visiting team's locker room painted pink - a much-debated attempt to, erm, relax the players more than they would have liked. Now, I do understand that if you're a man, a wall in the palest terracotta pink may not be worth risking your reputation for. I get it. Particularly after the color psychology experiment I recently set up for my wonderful, upright and totally unsuspecting English husband: I went and bought new bedlinen with gorgeous flowers printed all over it. Yes, they were pink. And yes, I should have known better. For what felt like a very long ten minutes, he actually refused to sleep under the new bedding! "I had an LOL moment when I read your comment that pink has a great acceptance in France ... it is my French husband's favorite color! We have a pink wall in the living room, tile in the kitchen with pink dots on it and a lavender-pink bedroom."